Exemption 8696 enables qualified companies to obtain an 8130-3 tag for Class 3 Products. View the list of Exemption Companies. 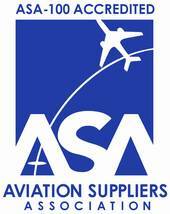 A company must be a member in good standing in the Aviation Suppliers Association. A company must be accredited in accordance with FAA Advisory Circular 00-56A or FAA Advisory Circular 00-56B. A company must be included on the FAA Accreditation List. This is the list of companies that are accredited in accordance with FAA Advisory Circular 00-56A or FAA Advisory Circular 00-56B.